On all Term Time Sunday mornings in the Parish Centre we host a Breakfast Club for families from 9.30am, followed by Junior Church starting at 10.10am ahead of the 10.15am Mass. On All Age Mass Sundays (Usually the first in the month) Breakfast Club will be held, even when this falls in the School Holidays; however, there will be no Junior Church. Breakfast Club is a very informal fellowship group who meet before the service and share a cup of tea or coffee and some breakfast together. All are welcome; however, we do ask that all children are accompanied by a responsible adult. At Junior Church children aged between 4 and 10 years are welcome to join us for a time of Bible stories, activities, prayer and fun. Parents of children aged under 4 years are welcome to bring their children and to stay with them, or to make use of the children’s area in the Church. Once we have finished in the Parish Centre, we move over to the 10.15am Church service in time for the start of the Eucharistic Prayer. During our time in the Church, we encourage children to sit with their parents/carers. For the younger members of our congregation, we have a Children’s area in Church which contains a selection of books, activities and games. Please feel welcome to use this area at any time during the service if you need to. We also have a newly fitted toilet and baby changing facilities towards the back of the Church (opposite the entrance) should you need to make use of them. We also have baby-changing facilities in the disabled access toilet in the Parish Centre. 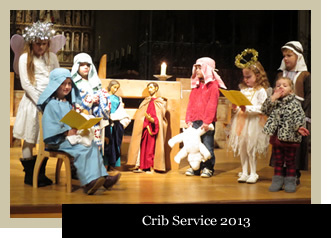 All Age Services usually take the form of an All Age Mass on the first Sunday in the month, with a few exceptions (March, April, September and December). These services are well attended by our Uniformed Organisations and aim to be inclusive for the whole family. All are welcome to attend this service and join us to worship as a Parish Family. If you are interested in discussing preparation for First Holy Communion and Confirmation for children and young people, please do get in touch using the contact details provided on the Contact Us page. If you are interested in having your child baptized, there is more information here.